Maria Owings Shriver (/ˈʃraɪvər/; born November 6, 1955) is an American journalist, author, and former First Lady of California. She was the wife of former Governor of California and actor Arnold Schwarzenegger, whom she divorced in 2011. She has received a Peabody Award and was co-anchor for NBC's Emmy-winning coverage of the 1988 Summer Olympics. As executive producer of The Alzheimer's Project, Shriver earned two Emmy Awards and an Academy of Television Arts & Sciences award for developing a "television show with a conscience". She is related to the Kennedy family; her mother, Eunice Kennedy Shriver, was a sister of John F. Kennedy, Robert F. Kennedy, and Ted Kennedy. Shriver is currently a special anchor and correspondent for NBC News. In her book Ten Things I Wish I'd Known Before I Went Out Into The Real World (2000), Shriver says that she became passionate about broadcast journalism after being sent to the back of the campaign plane with the press corps while volunteering for her father's 1972 U.S. vice presidential race, calling these orders "the best thing that ever happened to me." After her journalism career began with KYW-TV in Philadelphia, Pennsylvania, she co-anchored The CBS Morning News with Forrest Sawyer from August 1985 until August 1986, co-anchored NBC News's Sunday Today from 1987 until 1990. Shriver also served as Saturday anchor from 1989–1990 of NBC Nightly News. She was a contributing anchor on Dateline NBC from 1992 until 2004. In August 2003, Shriver took an unpaid leave of absence from NBC News when her husband became a candidate in the 2003 California gubernatorial recall election. On February 3, 2004, Shriver asked to be "relieved of [her] duties at NBC News," citing concerns the network had over the conflict of interest between her role as a journalist and her status as the First Lady of California and her increasing role as an advocate of her husband's administration. In 2005, Shriver launched her WE Connect Program, which connects working families in need with money-saving programs and support services. WE Connect brings together community organizations and businesses, government agencies and state leaders, congregations and schools as partners in responding to the needs of the millions of individuals and families who are struggling to make ends meet. Through a partnership with La Opinion, the nation's largest Spanish-language newspaper, WE Connect has developed three editions of a 24-page, full-color, bilingual supplement that has been circulated to over 20 million Californians in need. In December 2009, Shriver, in partnership with The Women's Conference, created the WE Connect–Million Meals Initiative. Through this initiative, The Women's Conference made a donation to The California Association of Food Banks to provide more than one million meals to California families in need. The donation was allocated to the food bank's 44 member organizations who then distributed the food to California families through its more than 5,000 community-based organizations. In March 2010, Shriver held a three-day Community Resources Fair in Fresno and Los Angeles through WE Connect. The fairs provided vital programs and free support services such as tax preparation, housing and home foreclosure assistance, job assistance, flu shots, healthy food distribution and more. Event organizers estimated that over 40,000 individuals took advantage of free services during the course of the two weekends and hundreds of thousands pounds of food were distributed. In 1977, Tom Brokaw introduced Maria to Austrian bodybuilder and actor Arnold Schwarzenegger at a charity tennis tournament being held at her mother's home. She married Schwarzenegger on April 26, 1986, in Hyannis, Massachusetts, at St. Frances Xavier Roman Catholic Church. They have four children: Katherine (born December 13, 1989), Christina (born July 23, 1991), Patrick (born September 18, 1993), and Christopher (born September 27, 1997). All of their children were born in Los Angeles. On May 17, 2011, Schwarzenegger publicly admitted to fathering a child with a longtime member of their household staff, Mildred Patricia Baena, 14 years earlier, and before his election as Governor of California. He confessed to Shriver only after she confronted him with the information, having earlier confirmed what she had suspected about the child in a confrontation with Baena. Shriver described Schwarzenegger's admission as "painful and heartbreaking." She declined to speak further on the issue, saying: "As a mother, my concern is for the children. I ask for compassion, respect and privacy as my children and I try to rebuild our lives and heal." Shriver filed for divorce on July 1, 2011, citing "irreconcilable differences". In 2009, Shriver was honored with the Shinnyo-en Foundation's 2009 Pathfinders to Peace Award, which is bestowed annually to a person who exemplifies the ideals of compassion, harmony and peace. At the presentation ceremony honoring Shriver, the foundation's chief executive said, "Maria Shriver sees the best in other people – their innate goodness – and inspires them to become their own 'Architects of Change'. In a world that glorifies ambition at any cost, Maria instead teaches character. She is a woman of quiet strength who role-models kindness and charity, and has used her celebrity to help create peace in the world." Maria Shriver (April 4, 2000). Ten Things I Wish I'd Known Before I Went Out Into The Real World. Grand Central Publishing. ISBN 978-0-446-52612-8. Maria Shriver; Sandra Speidel (October 16, 2001). What's Wrong With Timmy?. Little, Brown and Company. ISBN 978-0-316-23337-8. Maria Shriver; Sandra Speidel (April 28, 2004). What's Happening to Grandpa?. Little, Brown and Company. ISBN 978-0-316-00101-4. Maria Shriver (April 5, 2005). And One More Thing Before You Go... The Free Press. ISBN 978-0-7432-8101-0. Maria Shriver; Sandra Speidel (October 30, 2007). What's Heaven?. Golden Books Adult Publishing. ISBN 978-0-312-38241-4. Maria Shriver (April 15, 2008). Just Who Will You Be? : Big Question, Little Book, Answer Within. Hyperion. ISBN 978-1-4013-2318-9. Maria Shriver (February 27, 2018). I've Been Thinking...: Reflections, Prayers, and Meditations for a Meaningful Life. Penguin Publishing Group. ISBN 9780525559917. ^ Shriver known for her political bloodlines (October 9, 2003) Sydney Morning Herald. Retrieved February 5, 2008. ^ "TV academy honors 'television with a conscience'". Los Angeles Times. May 6, 2010. Retrieved October 8, 2014. ^ Winfrey, Oprah (May 30, 2008). "Oprah Talks to Maria Shriver". The Oprah Winfrey Show. Retrieved September 16, 2010. ^ About the Contributors Archived May 4, 2011, at the Wayback Machine The Shriver Report. Accessed May 23, 2011. ^ Well-known Georgetown Alumni Archived June 13, 2011, at the Wayback Machine. Accessed May 23, 2011. ^ Susman, Gary (February 4, 2004). "Terminated". Entertainment Weekly. Retrieved July 23, 2012. ^ "Maria Shriver won't return to NBC News". USA Today. Associated Press. October 24, 2007. Retrieved April 28, 2008. ^ Tanner, Adam (May 16, 2007). "Shriver says Anna Nicole frenzy ended her TV return". Reuters. Retrieved April 28, 2008. ^ Bianco, Robert (January 21, 2008). "Critic's Corner Monday". USA Today. ^ "American Idealist". Americanidealistmovie.org. January 21, 2008. Archived from the original on January 24, 2008. Retrieved March 23, 2011. ^ "California First Lady Maria Shriver". Womensconference.org. November 17, 2003. Archived from the original on December 23, 2009. Retrieved March 23, 2011. ^ "Special Olympics Torch Lights Eunice Kennedy Shriver's Funeral". CNN. August 15, 2009. Retrieved October 8, 2014. ^ "Shriver's legacy lives on through Best Buddies". Archived from the original on October 26, 2010. Retrieved October 8, 2014. ^ "We Include". State of California. Archived from the original on November 17, 2010. ^ "Using Ice Cream for Good: How Lovin' Scoopful is Working for the Special Olympics". The Huffington Post. April 29, 2010. Retrieved October 8, 2014. ^ HBO. "HBO Documentaries: The Alzheimer's Project". Retrieved October 8, 2014. ^ "Tina Fey, Justin Timberlake Among Big Creative Arts Winners". Emmys.com. September 12, 2009. Retrieved March 23, 2011. ^ McNamara, Mary (May 8, 2009). "'The Alzheimer's Project'". Los Angeles Times. Retrieved October 8, 2014. ^ "Maria Shriver Turns Spotlight On Alzheimer's". NPR.org. May 10, 2009. Retrieved October 8, 2014. ^ "Special report: Women today". MSNBC. Retrieved March 23, 2011. ^ Stengel, Richard (October 26, 2009). "The American Woman". TIME.com. Retrieved October 8, 2014. ^ "A Woman's Nation - Center for American Progress". April 15, 2009. ^ Carter, Bill (September 28, 2009). "NBC Plans a Week of Coverage on Evolving Role of Women" – via NYTimes.com. ^ Shriver, Maria (October 20, 2009). The Shriver Report: A Woman's Nation Changes Everything. ISBN 9781439187630. Retrieved October 8, 2014. ^ Shriver, Maria (October 19, 2010). The Shriver Report: A Woman's Nation Takes On Alzheimer's. ISBN 9781451628999. Retrieved October 8, 2014. ^ a b The Shriver Report: A Woman's Nation Pushes Back from the Brink: Maria Shriver, Olivia Morgan, Karen Skelton. St. Martin's Griffin. ISBN 9781137279743. ^ "A Special Message from Maria Shriver & the Shriver Report Team". July 31, 2014. ^ Shriver, Maria; Progress, Center for American (March 11, 2014). The Shriver Report. ISBN 9781137279743. Retrieved October 8, 2014. ^ "Maria Shriver heading back to NBC as special anchor". USA Today. April 30, 2013. Retrieved April 30, 2013. ^ "Maria Shriver Returns to 'Today' - TVNewser". Mediabistro.com. October 18, 2013. Retrieved August 19, 2014. ^ "In Step With: Maria Shriver". Parade Magazine. April 10, 2005. Archived from the original on June 5, 2009. ^ "Women's Conference's future in Long Beach uncertain after 2010". Archived from the original on June 13, 2011. Retrieved October 8, 2014. ^ "Maria Shriver, Meghan McCain Helping Women Find Voices". ABC News. Retrieved October 8, 2014. ^ "Maria Shriver Announces Her Women's Conference Lineup". Vanity Fair. Retrieved October 8, 2014. ^ "Maria Shriver Announces Star-Studded Women's Conference". July 14, 2008. Archived from the original on November 3, 2009. ^ "'Remarkable California women' honored with Minerva Awards". Archived from the original on June 15, 2010. Retrieved October 8, 2014. ^ "Betty Chinn accepts Minerva Award, wins over crowd". times-standard.com. Archived from the original on October 14, 2014. Retrieved October 8, 2014. ^ "'A tsunami of hope': Maria Shriver cuts ribbon on Eureka's first public shower facility". times-standard.com. Archived from the original on October 14, 2014. Retrieved October 8, 2014. ^ "Minerva Award Exhibit". California Museum. Archived from the original on December 12, 2010. Retrieved March 23, 2011. ^ Thadeus Greenson. "California first family hosts Betty Chinn, encourages outreach". Times-Standard Online. Archived from the original on May 6, 2010. Retrieved March 23, 2011. ^ "Gov. visits Bay Area in effort to feed the hungry". ABC7 San Francisco. Retrieved October 8, 2014. ^ "Maria Shriver At "We Connect Weekend" In Fresno". March 21, 2010. Archived from the original on October 14, 2014. Retrieved October 8, 2014. ^ Steinhauer, Jennifer (February 26, 2008). "California Creates Cabinet Post to Manage Volunteers" – via NYTimes.com. ^ "Obama and Maria Shriver: Making space for play – for all generations". USATODAY.COM. June 22, 2009. Retrieved October 8, 2014. ^ a b Abrams, Rhonda (June 12, 2009). "Strategies: Shriver's big on small loans, for good reason". USA Today. Retrieved October 8, 2014. ^ "Kiva Brings Microlending Home To U.S. Entrepreneurs In Need". TechCrunch. June 10, 2009. Retrieved October 8, 2014. ^ "Home Page | California Museum". Retrieved October 8, 2014. ^ "History". California Museum. Archived from the original on December 12, 2010. Retrieved March 23, 2011. ^ Skelton, George (November 26, 2009). "California Hall of Fame inductees range from excellent to just OK". The Los Angeles Times. ^ "California Museum and Maria Shriver Unveil 'A Museum without Walls'" (Press release). Adobe. November 17, 2008. Archived from the original on August 3, 2012. Retrieved July 23, 2012. ^ "Maria Shriver Touts New Online Learning Tool". CNET. Retrieved October 8, 2014. ^ a b Nagourney, Adam. "Maria Shriver Backs Obama". ^ "Breaking: California First Lady Maria Shriver Endorses Barack Obama". Organizing for Action. Retrieved October 8, 2014. ^ Buchanan, Wyatt (May 21, 2009). "Capitol edible garden arrives with star power". Politics Blog. Retrieved October 8, 2014. ^ MacVean, Mary (March 27, 2009). "Maria Shriver says edible garden will be planted in Capitol Park flower bed". Los Angeles Times. Retrieved October 8, 2014. 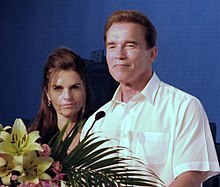 ^ "Maria Owings Shriver Wed To Arnold Schwarzenegger". April 27, 1986 – via NYTimes.com. ^ "The Birth of Katherine Schwarzenegger". California Birth Index. ^ Hax, Carolyn (May 10, 2011). "Arnold Schwarzenegger and wife of 25 years, Maria Shriver, say they're separating". Washington Post. Associated Press. ^ Barabak, Mark Z.; Kim, Victoria (May 17, 2011). "Schwarzenegger fathered a child with longtime member of household staff May 17, 2011". Los Angeles Times. Retrieved October 8, 2014. ^ Reich, Ashley (May 2011). "Arnold Schwarzenegger Fathered A Child With Member Of Household Staff". Huffington Post. USA. ^ "How Maria found out: Arnie's wife reportedly confronted lover about child". Sydney Morning Herald. May 20, 2011. ^ Powers, Lindsay (May 17, 2011). "Maria Shriver Speaks Out: 'This Is a Painful and Heartbreaking Time'". The Hollywood Reporter. ^ "Petition for Dissolution of Marriage. FamousDockets.com. Retrieved 7/4/2011". Retrieved October 8, 2014. ^ The Reliable Source (November 1, 2013). "Schwarzenegger follows his passion; Maria follows hers — a new boyfriend". The Washington Post. ^ "Shriver, Gore honored by TV academy". TODAY.com. Retrieved October 8, 2014. ^ "Maria Shriver – Dateline NBC". MSNBC. January 13, 2004. Retrieved March 23, 2011. ^ "Maria Shriver receiving Shinnyo-en Foundation's Award at 2009 NCVS". Retrieved October 8, 2014. ^ "The Maria Shriver Nursery". Saint John's Health Center. Retrieved July 23, 2012. ^ "Rose named in honor of Maria Shriver". Archived from the original on November 18, 2011. Retrieved October 8, 2014. 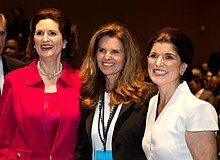 Wikimedia Commons has media related to Maria Shriver.